What happens when two creative communities join forces? They create The Vibe which lets you turn your favorite SoundCloud sound into a 3D-printed iPhone case. Want to touch the first sound you ever created? Want to carry your child’s first words around with you every day? No matter which sound you care about most, The Vibe by Shapeways lets you keep it in your pocket *and* protect your iPhone at the same time. Pretty rad. Be quick to take advantage of the special offer and print your favorite sound for $19.95 (excl. shipping and taxes). If you’re getting your own Vibe, make sure to tweet at us with a picture or let us know in the comments. Thanks to the Shapeways team for making this possible. Love Pro Tools? Love SoundCloud? Now using them together just got easier. Avid’s latest update to their cutting-edge audio production software includes sharing to SoundCloud – from creation to utilizing your online community, Pro Tools 10 has you covered. Pro Tools is one of the most popular audio production software choices for recording, composing, editing and mixing both music and sound used by leading music studios and Hollywood sound editors (e.g. Pro Tools was used in the making of movies such as Gladiator and Mission Impossible 2). The SoundCloud integration offers audio makers the freedom to collaborate and effortlessly share their works, whether it be a hit single, the soundtrack for a TV commercial or the sound effects for your favorite video game. With SoundCloud baked into Pro Tools 10, audio producers from all fields can share their sounds privately with collaborators for feedback or share polished works to the world. Throughout the creative process, Pro Tools and SoundCloud make audio production and promotion easier. In addition to SoundCloud, other key features in the update include Clip Gain, multiple file formats supported within one session and higher resolution sound with more headroom. Find out about all the new features in Pro Tools 10 here. SoundCloud and Avid are giving away a copy of Pro Tools 10 to an active member of the SoundCloud community who can let us know how SoundCloud sharing in Pro Tools will help improve your work flow. Share your recorded explanation with SoundCloud.com/pro-tools-contest . Tumblr and SoundCloud both are fantastic communities of people expressing themselves through the things they create; we think bringing them together is like a match made in heaven. So from today, we are thrilled to announce along with the fine folks from Tumblr that you can now easily share the sounds you create to Tumblr! Capture any audio on-the-fly with our iPhone and Android apps and share your recordings directly to your Tumblr blog. This is super neat for impromptu interviews, commentary, breaking news, comedy or poetry – heck, pretty much anything you hear around you. Here are some other nice recordings from Maura, Bijan, Caroline, David & Alex. In your advanced SoundCloud settings, you can now choose to automatically push favorites and new sounds you created to your Tumblr blog. Save time when sharing the sounds you create! Found something on SoundCloud you like? Easily post to Tumblr by pushing the Share button on SoundCloud or grab the url and post it as an external source on Tumblr Audio posts. 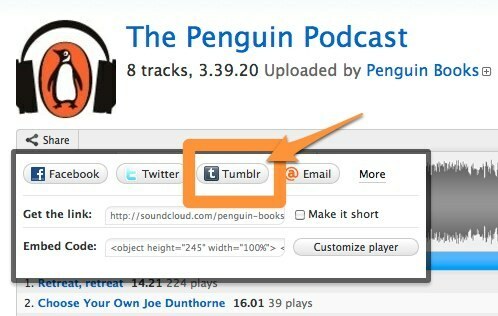 When creating an audio post, you can now search, preview and post audio from SoundCloud to Tumblr. Oh and in case you hadn’t noticed, we’re all big fans of Tumblr and a number of staffers use it every day for their personal blogs. Find out who does and follow at will! Thank you team Tumblr for your hard work on getting this out in the wild. We can’t wait to see what happens when people capture and use sound in their everyday lives, ultimately making the web less silent.